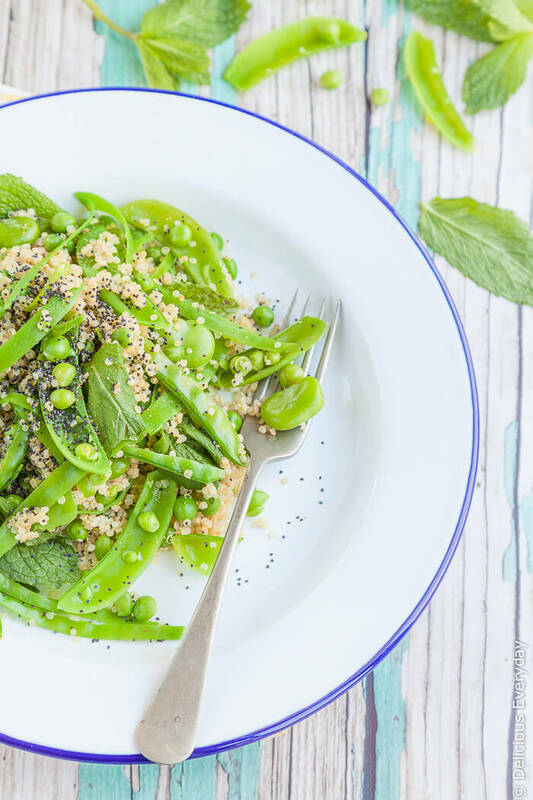 This gorgeous vibrantly green spring salad recipe is vegan and gluten-free and is the perfect way to celebrate the best of spring greens. The arrival of spring brings flowers out of hibernation while the warmer weather beckons you outside. And with spring, comes the arrival of spring fruit and vegetables. This quinoa salad, for me, is a celebration of spring. 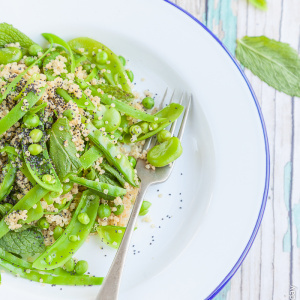 Vibrant green snow peas, sugar snaps, baby peas and broad beans are the star of the show. Quinoa adds body and bulk, turning this salad into a meal. While mint adds a further bit of brightness which contrasts beautifully with the sweet greens. The finishing touch is a simple lemon and mustard-spiked dressing, and a sprinkle of poppy seeds. If you don’t have poppy seeds try roughly chopped almonds or toasted pine nuts, or skip the nuts altogether. A crumbling of feta would be great here too, but sadly dairy and I don’t see eye to eye these days, but if you can tolerate it, it would make a fabulous creamy addition. I’d go for Danish feta, which is lovely and creamy, rather than Greek. Rinse the quinoa under cold running water for a few minutes, swriling the seeds with your fingers to make sure they are well rinsed to remove their bitter coating. Drain and place in a small saucepan with 1 cup of water over a high heat. Bring to a boil, cover with a lid, and reduce to low and cook for 13 to 15 minutes. When the quinoa is cooked remove from the heat and leave covered while you prepare the rest of the ingredients. Place the poppy seeds in a small frying pan over a low heat and toast for 2 to 3 minutes. Leave to cool. 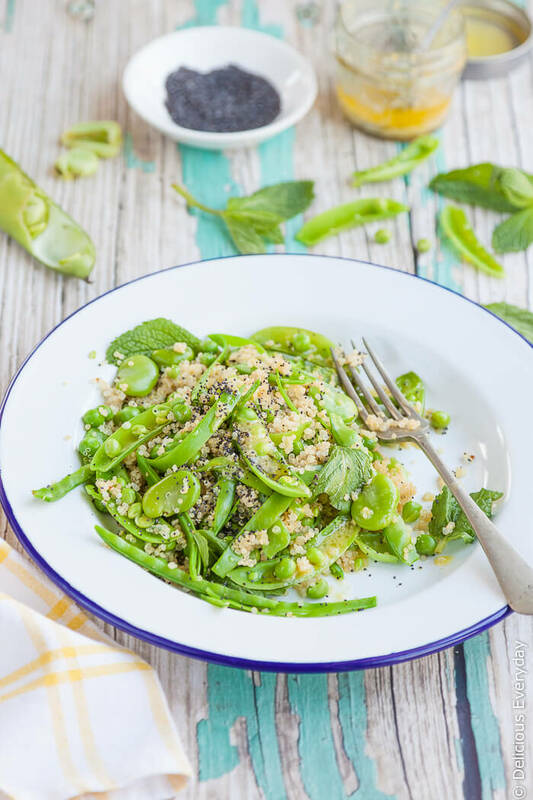 Remove the broad beans from their shell and trim the sugar snaps and snow peas. Bring a saucepan of water to a boil and fill a large bowl with cold water and throw in a couple of ice cubes. Add the snow peas, sugar snaps and broad beans to the boiling water and cook for 1 minute. Use a slotted spoon to remove them from the water and place in the bowl of iced water. Now cook the peas, for 1 to 2 minutes and place in the iced water. Remove the broad beans from their leathery jackets. Julienne the snow peas and cut the sugar snaps in half, lengthways. Make the dressing by placing all of the ingredients in a small jar and shake until well combined. Use a fork to fluff up and quinoa and place in a large serving bowl. 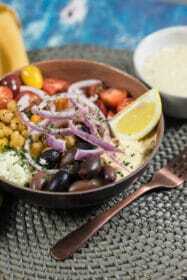 Add the spring vegetables and to the bowl along with the mint leaves and dressing. Toss to combine before scattering the poppy seeds over the top. Mmm! This salad looks absolutely delicious and I am sure it tastes even better! Will definitely need to try to make this! The photography is beautiful. Congratulations. Looks too good to eat. A delightful salad! Great summer flavours.